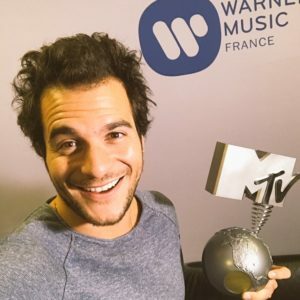 Last night, 2016 Eurovision participant Amir won an MTV EMA as best French act. When MTV hosted their 23rd EMA’s in Rotterdam three other Eurovision participants were nominated without winning. A Polish national final act however also took home a trophy. Four participants from this year’s Eurovision Song Contest were nominated. While Amir won, Laura Tesoro (Belgium), Douwe Bob (The Netherlands) and Francesca Michelin (Italy) didn’t. From Poland however national finalist and runner up, Margaret won an MTV EMA award as well. MTV is a commercial network of channels which broadcast music videos worldwide. The network hosts special award shows annually to commemorate those who have truly made their mark on the commercial world of music and music videos. The MTV demographic is mainly young adults and older teenagers. Since their re-brand, their focus is still music, but they are bringing in areas such as reality to the network. The EMAs is part of the MTV network of annual award ceremonies. The first EMAs were held in 1994 in Berlin, since then there have been many high-profile winners and nominees from Eurovision. Previous Eurovision participants who have also enjoyed EMA success include Lena (5 times winner) as well as Margaret, Helena Paparizou, Loreen, Dima Bilan, Marco Mengoni, Compact Disco and others. Eurovision is seen as a commercial success for those who are popular, although you do not have to win to be commercially successful. For those with huge commercial success, comes airtime on channels such as MTV. Amir Haddad, or Amir as he is simply known, is of Tunisian-Moroccan heritage. He has been singing since a very young age. He sang in a local synagogue and in various social events in Herzliya, north of Tel-Aviv. Amir was born with a hearing loss of 50%, this never bothers him, in reality it does make hearing music playback incredibly difficult, and as a result of this, simple tasks which may take artists a small amount of time, will take Amir longer. Despite his hearing problems he does not see this as a major factor, and is enjoying commercial success after a successful Eurovision season. Before Eurovision he had one album released, called Vayehi and this did not chart. Amir represented France in 2016 with J’ai Cherché. He was not present in Rotterdam to collect his award as he is currently on a nationwide tour. Tonight sees him in Bordeaux. Another key point in his career was becoming a finalist on The Voice in 2013. It was this event that catapulted him into European fame. He has had high scoring chart success in countries such as France (#2), Belgium (#5), Russia (#26) and Spain (#33). Below you can see Amir in our Would You Rather interview where we didn’t ask him about MTV EMA, but we did ask if he would rather win a Grammy or a Nobel Prize. See the video to find the answer to this and also to find out why he thought we were out to kill him! After winning, Amir was naturally happy. On Twitter he wrote; “When you hold for the first time the love of your audience in your hands! Thank YOU. Thank you. THANKS for this wonderful award!”.